According to ancient Mayan prophecy, December 21, 2012, marks the moment of humanity's rise or fall. Our "rise" depends on higher consciousness and raised vibration as well as the expanded awareness of a critical mass of people. As humanity enters the evolutionary transition from Homo sapiens to Homo luminous--from 3rd-dimensional human beings to 5th-dimensional beings of light--we are being called to fully participate in the dawn of a New World built upon unconditional love, co-support, cooperation, equality, unity, peace, justice, and sustainability. Sounding the clarion call for a global shift in consciousness starting at a personal level, Nicolya Christi presents a step-by-step guide to healing and transforming your inner world--an essential step toward co-creating a world shift as we head toward the tipping point of 2012. She offers core psychological insights and exercises, spiritual teachings, guided visualizations, and a concise overview of the spiritual and astronomical events surrounding 2012, as well as identifying the signs and symptoms of the 12 different stages of ascension, a process that millions are currently experiencing as we approach the global spiritual awakening of 2012. She explains how to clear past-life, ancestral, and current trauma imprints lodged within your energy field to accelerate the process of conscious evolution and ascension. Revealing that many people chose to reincarnate in this lifetime as "midwives" to help birth the New World, this book provides a way to rediscover your soul's higher purpose, thus serving your own evolutionary journey as well as that of the Earth. 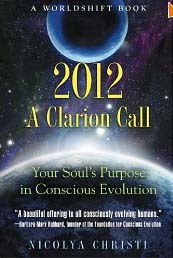 To Order 2012: A Clarion Call from Amazon.com, click here! The following two years of 2011 and 2012 have the potential to be the most critical in the history of humanity. As the all important date of 21st December 2012 approaches, we feel the compulsion to understand just what it is we can contribute to help ensure the crossing of the threshold into what has become known as 'The Great Shift of Ages'. Many are now willing to commit themselves, heart and soul, and accelerate their own conscious evolution in order to help other individuals and humanity as a whole to 'wake up' during these crucial couple of years. It is essential now that we focus on the evolution of our own consciousness, as well as that of the collective. This is what must take precedence in our hearts, our minds and our lives, if we are to help with the immense global changes humanity now faces. These sweeping changes, prophesied by our ancient wise elders, including the Maya, are vital for world peace and a sustainable future, not only for ourselves, but for the generations to come. Never before in the history of humankind has your contribution to the world been more needed. Never before in our history could your contribution make the difference between humanity stepping onto a new path of peace and sustainability, a path of light, or remaining on the existing dark path of destruction, as we step over the threshold of 2012. To put it simply, there are two options ahead of us, as predicted by ancient civilizations. One option is to continue on the current dysfunctional path that ultimately leads to breakdown. The second is to step onto a new path that will lead us to a New Earth and a new way forward that ensures not only the survival, but the flourishing of the Earth and all life. Which of these two paths do you choose? The path of love, light, consciousness, truth, liberation, unity and transformation? Or the other, a path of fear, suffering, darkness, unconsciousness, manipulation, conditioning and duality? The choice is ours. We can either choose the path of love or the path of fear. Each individual decision is now critical to the outcome. Preparation for and commitment to our new roles is now essential. We have less than two years remaining before the prophesied Shift of Ages. The important question is: 'Will we reach the great destiny that awaits us'? The answer to this is down to us, both individually and collectively. It is our human and spiritual responsibility to do everything we can now to assist in raising planetary vibration and consciousness. Why not join one of our '2012: A Clarion Call' Events and find out what your role is in ensuring that the Great Shift of Ages unfolds? As we move forward from the year 2012, the unknown future, our ongoing commitment to an era of peace on Earth is essential to enable the divine blueprint of the New Earth to begin activation. It is vital that you understand what you are here to contribute and how to do this, even if it is impossible for you to grasp the bigger picture in terms of prophecy, quantum physics, astronomical events, or the existence of the limitless multidimensional beings who guide and help us each step of the way. It is not imperative that you understand any of this. What is required is the willingness to open your heart to all sentient beings and forgive those who have trespassed against you. A beautifully simple technique to help you to work on forgiveness is a modern version of an ancient Hawaiian Huna healing method known as Ho'oponopono. In this practice four short sentences are repeated with feeling: "I'm sorry. Forgive me. I love you. Thank you." This can be done with specific individuals in mind. Or the phrases can be said without focusing on anyone in particular. This enables the healing of deep unconscious soul wounds that may go back lifetimes. By being conscious in thoughts, words, and deeds, you will serve the higher good. It does not matter who you have hurt or how you have been hurt. This is a time of redemption. You have an extraordinary opportunity to be free of pain and suffering. Ultimately, the single most important requirement is your willingness to act with love toward everyone and everything. The laws of the universe ensure that your soul will be rewarded in equal measure to your contribution and your ability to remain heart-centered, loving, and kind toward yourself and others. The energy of forgiveness, together with your willingness to raise your consciousness, will bring many unexpected and beautiful gifts into your life. Acting as if is a powerfully effective practice to foster a new way of expressing yourself. In order to act as if, first think of one person who is an exceptional example of unconditional love and acceptance. This will be someone you experience as an inspiration, a person who conducts himself or herself in an exemplary and refined manner and who is kind and forgiving. You may or may not know this person. It may be a spiritual figure, family or community member, or someone whose life story guides you. To act as if entails emulating the individual who inspires you in certain situations. At first it may feel uncomfortable, yet it will be of enormous benefit to the world. If practiced over a period of time, acting as if will lead you to your true Self, for what you found so inspirational about your role model was really a reflection of yourself. By aligning your consciousness with the image, conduct, or experience of the person, by asking yourself when challenged by life, "What would this person do in the same situation?" "How would he or she respond?" "What would he or she say?" and then emulating this behavior, you will connect to the wisdom already held within you, as well as help humanity by your willingness to change. Acting as if re-informs every cell of your body, alters brain chemistry, and reprograms conditioned behavior. Acting as if, in a positive and loving way, closes old negative neural pathways and opens positive new ones. It sends powerful signals and new messages to the unconscious mind. Acting as if is a preliminary to the profoundly transformative lost mode of prayer discussed in chapter 12. This beautifully simple exercise is a profound method of absorbing the vibration of a great master and integrating his or her influence into your way of being. 1. Close your eyes and turn your attention inward. Follow your breath as it leads you to your heart. Allow yourself to rest in the stillness of your heart. 2. Slowly begin to create a picture of a perfect being. This may be someone you aspire to emulate or it could be your future Self. Begin to intensify the image or feeling of that being until you can see or feel him or her as vibrant and alive in your imagination or felt sense. 3. Place the energy and the image of this perfect being in your heart. Deepen your connection by inviting his or her energetic presence into every cell in your body. 4. Set an intention to be guided by the grace of the master's presence. Ask this being to walk with you as a role model in all endeavors and encounters. Choose to respond emotionally and mentally as you imagine this person would. Love in the way he or she would love. Allow your thoughts to reflect those of the master in your heart. 5. Invite the energy of this beautiful being to envelop your light-body and to permeate your physical body, bringing the gift of self-healing and an enhanced ability to heal others. By inviting the energy of this highly developed being into your heart, you heal your heart, attain a higher vibratory field, and can radiate loving-kindness out to the world. If you practice this every day, over a period of time you will absorb the vibration of the master in your heart and integrate his or her influence. You will increasingly resemble the being of great wisdom who resides in your heart. Carry this energy in your heart as if it were a precious jewel. Express gratitude for the gift of something so exquisite and perfect. Nicolya Christi is a conscious evolutionist, writer, spiritual teacher and mentor, global activist, and workshop facilitator. The founder of the WorldShift Movement, she lives near Rennes-le-Chateau in southern France. "In this beautiful, inspiring, and timely book, Nicolya Christi adds her wise voice to those of the Mayan Elders for whom 2012 heralds the promise of an evolutionary leap for humanity. Nicolya's clarion call is an empowering guide to help us envisage and co-create our cosmic destiny." "A beautiful offering to all consciously evolving humans." "Christi provides us with a step-by-step process to heal and transform our own inner world, because the changes need to be made within ourselves before changes can occur in the outside world. . . Nicolya Christi is a good role model to follow." "This is the most remarkable spiritual book on this or any other subject that I have ever read." ". . . Christi outlines the imperative and indicators for conscious evolution, asking each human to heed the call and realize what could be the soul's highest purpose." ". . . an uplifting, inspiring, and educational treatment about the year 2012, and what happens when we reach the end of the Mayan calendar. The book is a spiritual journey in and of itself that is work taking, whether you are a 2012 enthusiast, skeptic or newcomer. Regardless of what happens on December, 21, 2012, Christi's book serves as a profound roadmap for our human destiny, our spiritual evolution, and our role in the cosmos." ". . . an important read."